SlimPhatty, Analog Synth Rack/Sound Module from Moog Music. Moog Music announced the limited edition release of an all white series of its classic analog instruments. Moog has polarized the color of their traditionally black steel and natural wood instruments to a solid white finish. Included in this limited edition white release are the Slim Phatty, Minimoog Voyager, and the Minimoog Voyager XL analog synthesizers. Moog has also included the entire line of Moogerfooger Analog Effects Modules in this all white release. In addition to the polarized color, the Slim Phatty now ships with 100 new, artist-designed presets made specifically for this limited edition analog synth. The sound designers that crafted the new preset bank are Phil Hartnoll and Paul Hartnoll of Orbital, Producer Chad Hugo of N.E.R.D. and The Neptunes, and DJ/Sound Designer Dom Kane. The Slim Phattys optional wood sides, and optional rack ears are also now available in white. The Minimoog Voyager and Minimoog Voyager XL have also been transitioned to an all white finish with reversed artwork. The pitch and mod wheel of the Minimoog Voyager XL has been upgraded to a white backlit design, which is a feature that was previously only available on the Minimoog Voyager. Lastly, the Moogerfooger family of analog effects modules also get white versions of their former selves. The MF-101 Lowpass FIlter, MF-102 Ring Modulator, MF-103 12 Stage Phaser, MF-104M Analog Delay, MF-105M MIDI MuRF, MF-107 Freq Box and the MF-108M Clusterflux have all been transitioned to white and are now a perfect match to the limited edition Minimoog Voyager, Voyager XL and Slim Phatty Analog Synthesizers. These all white Moog instruments are available for a limited time at select dealers and are shipping now. 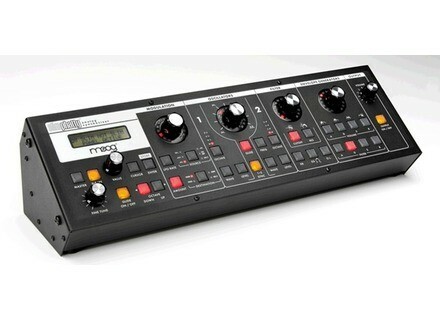 International customers must check with the Moog distributor in their country for pricing and availability. Elektron Analog Four Teaser Video It looks like Elektron is cooking up something really weird in this new teaser video. Ltd Edition 10th Anniversary Minimoog Voyager Moog Music announced the release of its limited edition 10th Anniversary Minimoog Voyager. "Make Over My Rig" Contest HK Audio USA, along with Lâg Guitars USA, VOX USA and Korg USA, are giving you a chance to win a live performance setup in a contest.